Sport consists of preparation and performanceabout 99 percent preparation, 1 percent performance. You know the importance of physical fitness in sport, but do you know how to train your athletes to perform at their best?Sport Physiology for Coachesis designed to help coaches assess, refine, enhance, and improve athletes'performance through an applied approach to exercise physiology. 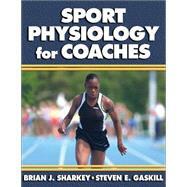 Written primarily for high school coaches, this practical, user-friendly text not only covers training essentials for muscular and energy fitness, but it also provides the hands-on assessments, forms, and training plans to help you implement the concepts in your training sessions.To guide you in the development of a training program for your sport, the book features sample programs for sports involving skill, power, power endurance, intermittent activity, and aerobic activity. You'll learn the principles behind development of muscular and energy fitness, differentiate between myth and science, and glean the latest training techniques and lessons from science and top coaches. In the end, you'll come away with a systematic approach and integrated training plan for developing your athletes'energy and muscular fitness. With Sport Physiology for Coaches,you'll discover how knowledge of sport physiology and training can contribute to your athletes'success and to your understanding and enjoyment of coaching.Sport Physiology for Coachesserves as the text for the American Sport Education Program (ASEP) Silver Level course, Sport Physiology for Coaches.